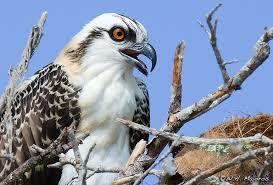 Nestling – A young, recently hatched osprey that has not yet grown flight feathers and is unable to fly. 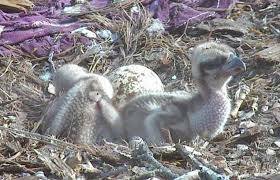 Nestlings are entirely dependent on their parents for food and protection. 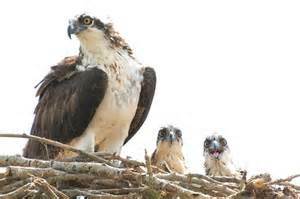 As osprey mature and begin to grow their adult flight feathers, they are no longer called nestlings and instead are referred to as fledglings. Fledgling – A young osprey that has grown enough to acquire its initial flight feathers and is preparing to leave the nest. Young birds that have left the nest but do not yet have all their adult plumage and are still fed by the parent birds are also referred to as fledglings. Fledgling plumage is most visible on a bird’s wings and tail, where the flight feathers will appear much shorter than an adult’s feathers. Fledglings are capable of flying but are inexperienced and may seem reluctant to fly or may show difficulty with takeoffs, landings or distance flight. As the feathers continue to grow, the birds will gain more flying skill and their plumage will become indistinguishable from adult birds. O&H cannot be more proud; proud but responsible parents. The danger for Tweedy has just begun. Studies show that only 50% of raptors survive their first year after fledging. Migration is risky business. In just a few weeks Tweedy must be prepared for the dangerous and grueling migration to South America. It’s well over 1000 miles.